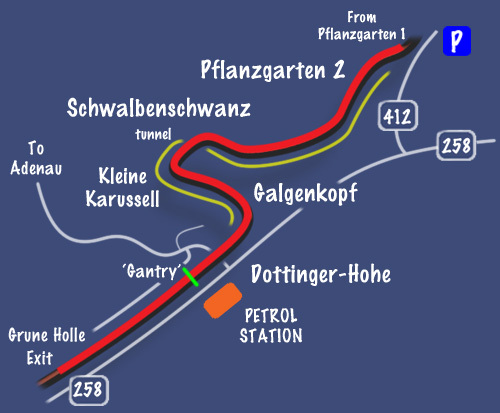 Last part of the lap now, a very fast swoop down and up out of Pflanzgarten 2 and around towards Schwalbenschwanz and the Kleine Karussell, then a sweep around and onto the final straight at Dottinger-Hohe. Reverse shot looking back at the crest you swoop over into Pflanzgarten 2. 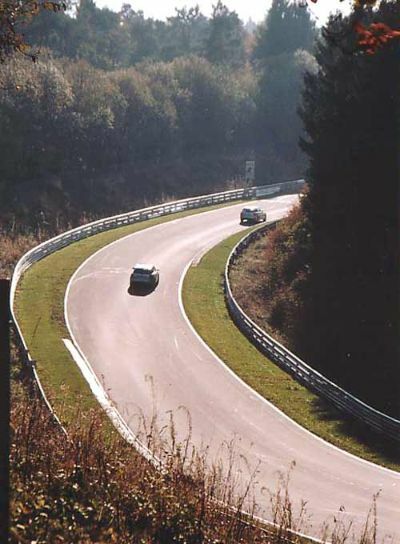 Looks steeper when in the car. 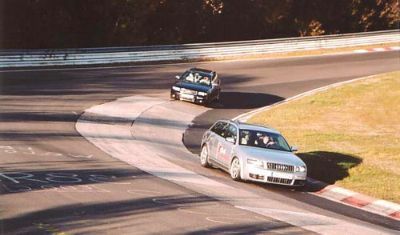 Looking down as the Audi's sweep through the dip at the bottom. The track looks so much wider than when you are actually driving it. 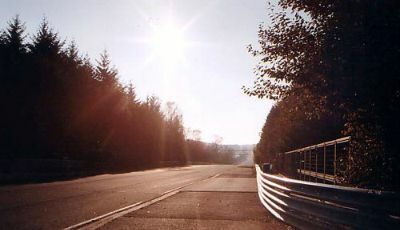 The first lap you ever do, all you will see is all that Armco that seems to be sooo close! Reverse shot looking at the same crest and dip - known as Pflanzgarten 2. Right from that crest it is pretty much flat out for the following section to Schwalbenschwanz. Once you know what is round the corner this is easily flat. Guess who! It would have been nice to see some different cars driving around the circuit. 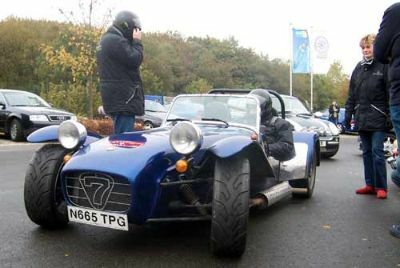 In previous visits we saw the Maclaren Mercedes SLR being tested - far more exciting than the S4s'! Reverse shot looking back at the sweeping start to Schwalbenschwanz. Actually more uphill than it looks here. Right under this corner there is a tunnel that allows you to cross under the track, in our case from the outside to the inside of the circuit. Over a slight crest and away down towards the Kleine Karussell. Look over your shoulder at this point and Nurburg Castle is again back in view. Reverse shot looking at Kliene Karussell - the 'Little Carousel'. You enter this banking, which starts off as a heavy camber, at some speed! You can really lean on this corner and slingshot out of it. But it is really bumpy, and you are convinced something on the car is going to break or ground-out! Nice wide exit from the corner inspires real confidence to attack it - from now on speed is critical to a fast lap as you are building up to the long drag down the main straight. Kliene Karussell on the left, approach to Schwalbenschwanz in the background. After the 'Little Carousel' you sweep up towards Galgenkopf. 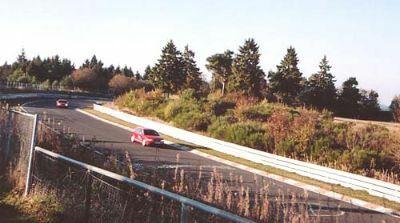 Another corner where initial caution and braking leads to a slight lift, if any, as you sweep through its large opening arc. 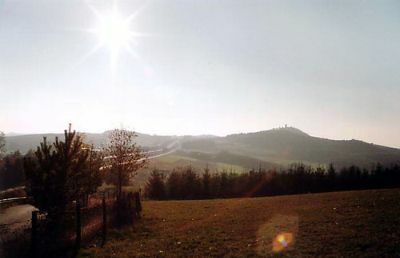 View back over the crest towards Nurburg and the Castle. 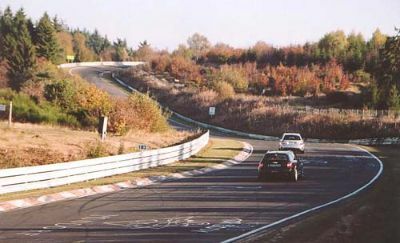 The 2 silver strips on the left are the track on the left, and inside it the public road up to the 'Grune Holle' entrance and Nurburg village. 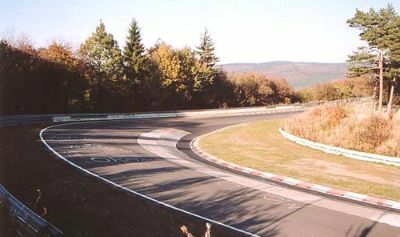 View from the exit of Galgenkopf and onto the main 3km straight at Dottinger-Hohe. 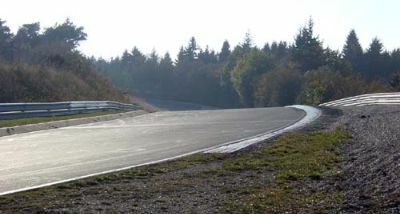 This shows the Gantry of 'Bridge to Gantry' fame - where you stop your stopwatch on a timed lap around the Ring on a public day. 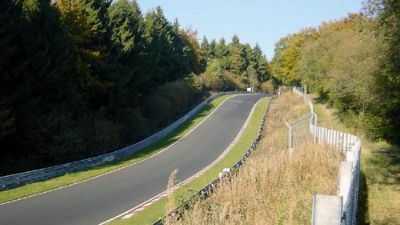 There follows a blast back down the straight until you reach the cones that direct you back into the 'paddock' area and the 'Grune Holle'. There is a speed limit as you approach the cones - which most people seem to ignore! To be honest we tended to lift after passing under the gantry and take a deep breath! Time for a quick chat as the car gradually slows down and perhaps cools off a little as you approach the exit, 'cos you certainly haven't been chatting whilst driving around the track! 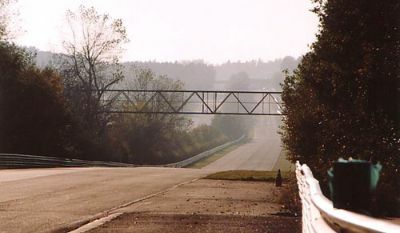 Gantry as seen from the main road outside the track, the 258, by the petrol station. Plenty of time to cool off after passing under the Gantry in the far distance and exiting the track just behind the crest you can see, looking back from the bridge at Antoniusbuche. 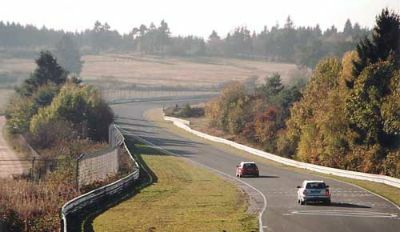 And there we are - a lap of the Nordschleife. Take a break, perhaps check the car over and then do it all again! 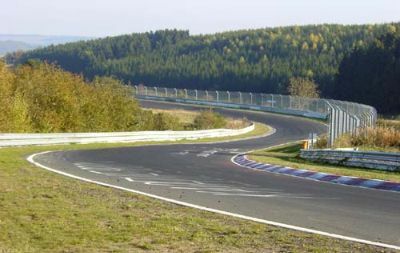 After each lap you exit the track at the 'Grune Holle' - of course you can come in and drive straight through up to the barriers and set off on another lap. On our recent trip the most we did in one go was 4 laps. That is almost 50 miles of hard concentrating, and I should have stopped after 3 laps for a break. Halfway through my 4th lap I found my mind wandering - and that is when a corner jumps out at you, or a faster car goes un-noticed and makes you jump as it comes past - you didn't even know it was there. Take a break and do not do too much at once. Oh, and watch the petrol level. 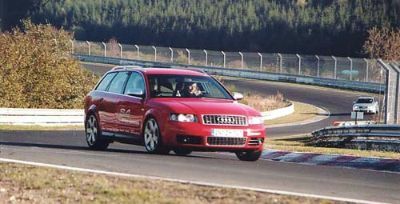 Remember 'just one more lap' is actually 13 miles of high fuel consumption! running out and having to be towed off would prove to be very expensive! On our October trip we did about 25 laps in total. 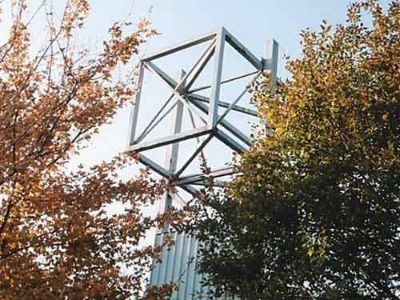 That was spread over 1 and a half days of public sessions. Our car covered its 50,000 mile in our possession while we were on the track, which I think is kind of fitting, and as usual did not miss a beat, and did us proud! 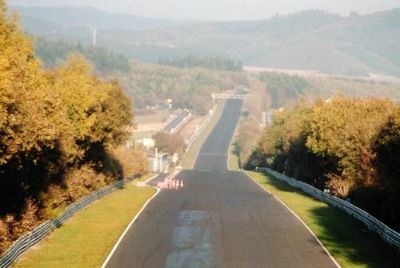 Main straight leading from Dottinger-Hohe up to Antoniusbuche. Under the track at Dottinger-Hohe en route to the petrol station for much needed refreshment. 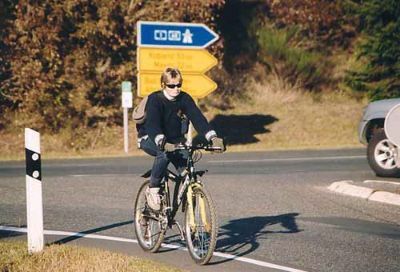 At this point on our bike ride - Dottinger-Hohe - we had intended to cut back across the middle of the Nordscleife on the public roads and 'freewheel' down to Adenau. 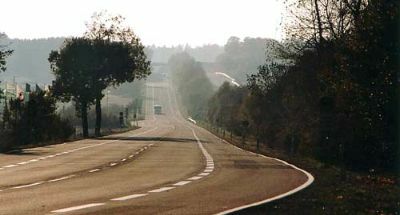 But we had come this far, so decided to carry on along the track and complete a whole lap. We had taken so long to get this far, taking pictures and watching Audi's that it was now about 3.30pm on an October day. We had set off at about 10.30am! 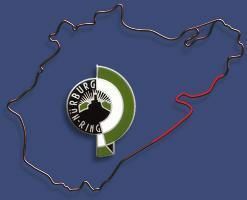 After a drink and a snack at the petrol station at Dottinger Hohe, we set off and continued to follow the track. To be honest we were both knackered - but we had to do it after coming this far on such a lovely day. Well done to Tessa who by this time had had enough really. New shoes were starting to hurt, but she carried on and we did it. It should not take that long, but because we had set off only intending to do half a lap we had taken the first half very slowly. The climb from Adenau Bridge to Hohe Acht is almost 300 metres in elevation. 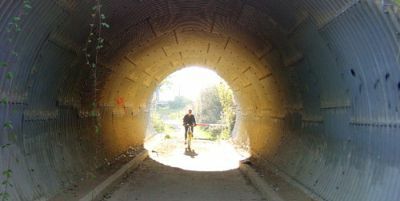 This explains why the end of our bike ride back down into Adenau ended up in pitch darkness! but it was worth it. You get a unique perspective on the track and I would highly recommend doing it if you have the time. After we decided to carry on around and complete a full lap on the bikes, this long incline was not the best view we could have had on leaving the petrol station! 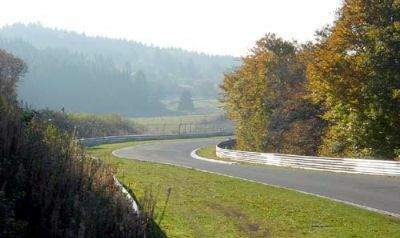 So there we go - a lap of the Nordschleife in pictures. Hope you have enjoyed the images. 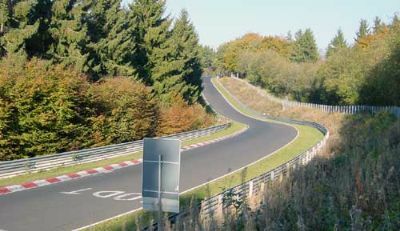 If you have been there before and driven the circuit I hope that this has given a new interesting perspective on corners you may well have driven many more times than I. If you have never been there then I hope the pictures encourage you to do so. We love it and look forward to returning as soon as we can. Of yes - special mention to Tessa. She gets pretty nervous about driving on track, but at the end of our last day she did one lap, on her own, and most importantly, really enjoyed it. Well done to her! I felt really proud as she drove back into the paddock where I was waiting with a massive grin and a sense of achievement on her face.